are now available for download in PDF format here. Acoustiblok is a unique barium free flexible 1/8" thick 1.1 lb. psf U.L. Classified, high STC reinforced dense noise isolating material which is utilized as a structural treatment for reducing sound transmission. It contains no lead, barium or asbestos materials. It is specifically formulated to meet rigid requirements such that it is approved by U.L. for walls, ceilings and floors (see U.L. classification), also U.K. tested "B.S. 476: part 7". Acoustiblok is typically applied as part of layered wall, ceiling or floor construction. It is usually stapled to wood studs or screwed to metal studs prior to drywall. Each layer of 16 oz. Acoustiblok reduces sound transmission by as much as 30 dB depending on the frequencies (see "Riverbank Lab" test results below). It has the same sound deadening effectiveness as lead without lead's problems. A typical 2 x 4 gypsum stud wall is usually 33 to 35 STC. Just one layer of Acoustiblok installed in the 2 x 4 wall is lab certified at an amazing "STC of 52" (STC 53 if with MTL studs), better than 12" of poured concrete (STC 51). NEW! Certified independent testing of an Acoustiblok ThermaBlok® wall assembly has validated a wall R value increase of up to 40%. See below for detailed information. Acoustiblok's U.L. Classification file number is R21490. Acoustiblok is approved for use in over 300 wall and floor/ceiling designs in the Fire Protection Catalog. See the Acoustiblok page at Underwriters' Laboratories, for approved wall and floor/ceiling design series. Beware of code compliance claims based on the "U.L. 94" flame test standard, which only"...tests for flammability of plastic materials used for parts in devices and appliances." With regard to U.L. Std 94, Underwriters Laboratories specifically state, "These requirements do not cover plastics when used as materials for building construction or finishing." Acoustiblok audio specifications (STC, NRC, IIC) are independent laboratory test results by Riverbank Acoustical Laboratories, NGC Testing Services, and Intertek ETL/Semko. Original reports are available from your Acoustiblok sales representative on request. Don't put your project at risk by relying on uncontrolled vendor "field test" or self test results - insist on hard numbers from certified independent laboratory tests when specifying acoustical solutions. Acoustiblok is a U.L. classified flexible high STC sound isolation material. U.L. approved for use in U.L. rated wall designs of U300, U400 and V400 series. Also for use in U.L. rated floor/ceiling designs of the L500 series. High electrical resistance. No fungal growth per ASTM D 3272 & ASTM D 3274. Weight is 1 Lb. per sq. ft. Properties: Non-corroding, waterproof, tensile PSI min 510. thickness of .11± .03 inches, minimum of 26 STC, no deformation at 200 degrees F. pass burn test per mil std1623. pass burn test MVS 302 and self extinguishing, DIE 'C' tear (#IN) tested, available in rolls of 54" x up to 350'. U.K. tested B.S 476:part 7. Transmission loss of 19DB@100hz. Independent certified laboratory test results demonstrate using additional layers of drywall is not a substitute for an Acoustiblok installation: Beyond the fact that the STC of Acoustiblok is better, it is very important to understand and remember that the objective is to reduce what a person hears, and is annoyed by, from the other side of a wall. Before making a decision on what building materials you select a few basic fundamentals must be understood. STC (sound transmission classification) ratings are an averaging of frequencies from 125 Hz to 4000 Hz. The ear however does not hear all frequencies equally. The maximum sensitivity of the human ear occurs between 2,000 and 4,000 Hz. (This is also where most speech information is concentrated). Frequencies above 2,000 also tend to to be more annoying than the middle or low frequency sounds. In addition, sound information such as a voice or music is difficult for the human ear to disregard and thus become even more annoying. All this being said, making noise reduction comparisons should focus mainly on the frequencies from 2,000 Hz to 4,000 Hz rather than the STC. 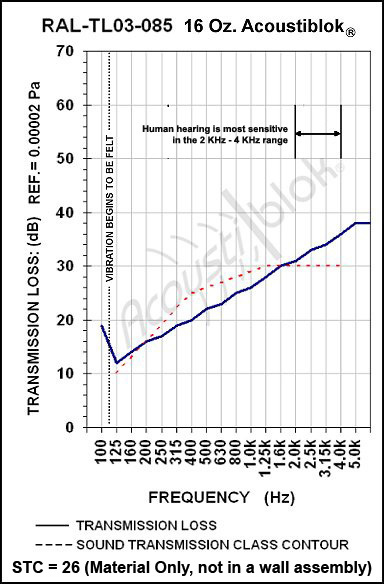 As indicated by independent certified lab tests displayed on the transmission loss graph, not only is the Acoustiblok better overall, but in the critical ranges of 2,000 Hz to 4,000 Hz the Acoustiblok is over 10 dB better in noise reduction. This 10 dB to the human ear is perceived as twice the amount of noise reduction (half as loud) compared to the double layers of gypsum. In addition the superior acoustical performance, Acoustiblok provides many other significant advantages. Impervious to water, mold or U.V. Barium free Acoustiblok vs. "Mass Loaded Vinyl"
Do not expose yourself to serious liability by using a substitute product that is not U.L. classified and certified for your specific building assembly. Acoustiblok is U.L. classified for over 400 construction assemblies. (U.L. classified indicates that every 3 months U.L. makes an onsight visit and tests the materials formula and manufacturing process during manufacturing to insure no changes from the tested material). Contact Acoustiblok for original acoustical test reports and technical information. Acoustiblok Sound Isolation Material is often held as the reference for barrier type noise isolation materials. It is often heard that manufacturers of similar looking barrier materials are saying "Our product is the same as Acoustiblok", they are not. The Acoustiblok is a proprietary formulated barium free viscoelastic polymer that is unmatched in either acoustical and fire performance or in international industry acceptance. Acoustiblok has achieved the optimum balance of mass, flexibility and fire resistance with our proprietary barium free formulation. While published densities of 1 lb/Sq Ft. is often used as the validating point for the products being the same; the reality is, if you compare same size samples side by side you will find that there are significant weight and flexibility differences between the materials. Some similar materials are stiff and heavy; others are limp and light, and others in between. Acoustiblok's unique material composition expends the greatest amount of acoustical energy of any similar product or assembly size. Acoustiblok Sound Isolation Material has been extensively tested acoustically by independent accredited facilities, within many different wall and floor/ceiling configurations. Lab tests provide an accurate baseline of performance repeatability in your project installations. “Field tests’ should never be used for establishing project performance specifications due to the many variations of materials, installation, room sizes, etc. Many of the manufacturer's published acoustical ratings are nothing more than copied ratings from other similar material websites, marketing brochures, or are calculated values. In fact, no “equivalent’ product, that we're aware of, has actually been tested and produced a valid test report to substantiate their claims. Ask for a certified copy of any specification or U.L. classifications claimed which must be in their name. As the manufacturer, Acoustiblok's proprietary formulation and manufacturing process controls are regularly monitored by U.L. Labs to assure consistent product performance. STC ratings are only a portion of the acoustical differences. Acoustiblok has performed extended frequency testing of its wall assemblies to provide a more accurate “real world’ performance reference. STC ratings are established based upon transmission losses of frequencies only between 125 and 4000 Hz. This test specification was established long ago to cover basic vocal ranges.Todays lifestyles of higher density living, modern electronics, and other factors show that this limited test does not provide an accurate indication of the assemblies effectiveness in present day living. 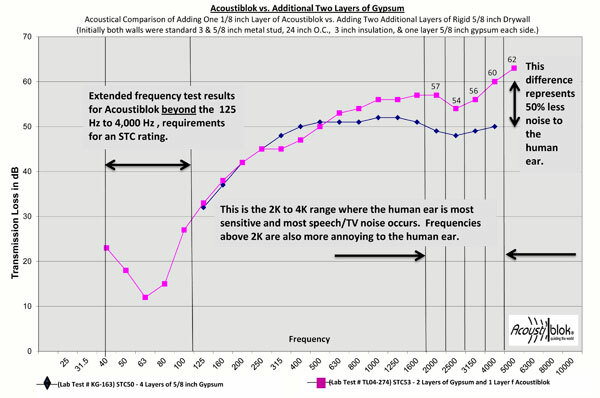 Extended frequency testing shows that Acoustiblok provides an incredible 23db reduction at 40 Hz, in a standard single stud assembly with only one layer of Acoustiblok. Because of Acoustiblok proprietary formulation it is approved (classified) for more (over 300) U.L. rated construction assemblies than any other sound abatement product. To our knowledge there is not a similar tested product that has proper U.L. classification at all. Many manufacturers state approval to a UL94 standard which is not applicable for building construction applications. In UL94 spec paragraph 1.5 it specifically states “These requirements do not cover plastics when used as materials for building construction or finishing’. Acoustiblok is a self extinguishing material while many of the similar products are rubber based materials that are combustible. Acoustiblok Material is rated with the highest score possible (10) for protection against mold & mildew growth (independent & certified ASTM D3273 test). We know of no other similar product achieving an acceptable rating let alone the highest rating, 10. Acoustiblok Material is also good for the environment as it is a barium free, recyclable product and it is manufactured using over 80% organic and recyclable material content. Non hazardous, odor free and will not diminish in performance over time. Using a name brand product which is recognized and installed throughout the world (even winning awards in the British House of Commons) will of course add to the resale value and credibility of any building. Thermablok® is a revolutionary advancement in acoustic thermal technology. The use of space age nano-particle technology has produced a material that not only has the lowest thermal conductivity rating of any thermal insulation (13,5mW/m-K), but has exceptional acoustical properties as well. Thermablok is a flexible fiber composite material, 3/8" (9.5mm) x 1 1/2" (38mm) wide x 8' (2.44m) long. 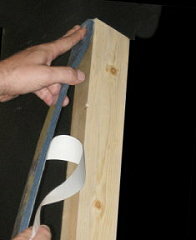 It is installed directly to the wall framing, before the installation of Acoustiblok or the drywall. ThermaBlok has a peel and stick backing for quick and easy installation and is easily to cut to size. Certified independent testing of an Acoustiblok ThermaBlok wall assembly has validated a wall R value increase of over 40%. Annual energy savings from the use of this product provides a quick ROI cost recovery while providing considerable energy savings over the project life. Additionally, Thermablok provides improved noise reduction characteristics through its acoustical dampening properties. When independently tested the Acoustiblok Thermablok assemblies provided STC (57) performance, virtually equivalent to 24" of solid poured concrete (STC58)! NASA named Thermablok aerogel insulating material to its Top 50 list of products in the newly released 2009 edition of Spinoff, NASA's annual premier publication featuring companies that have successfully adapted NASA technologies to everyday products and made them available to average consumers. Visit the all new Thermablok website for complete information and technical specifications.